Sadly, an accident in the rush hour traffic conspired against me and I arrived at the Guildhall just as the support band was leaving the stage. Much to my surprise, this show wasn't a complete sell-out but in fairness, there have been other, easier access venue choices within range on this tour, so maybe that's why. Judging by the T-shirts and the queue at the merchandise desk before the show, this audience is most definitely made up of fans as opposed to the intrigued. 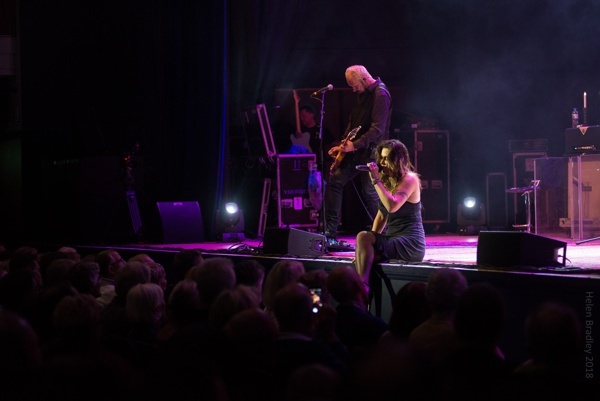 Beth Hart enters the Guildhall from the soundstage, she sashays through the crowd up onto the stage as she sings Etta James' 'Something's Got A Hold of Me', this delights the members of the audience who are either mesmerised at being so close or grabbing the opportunity to shake her hand and kiss her. Hart connects with an audience like no other artist I can think of, she perches on the front of the stage and introduces the audience to her 'Mom', who she often cites as her strength and musical influence, and dedicates an emotion-laden version of Billie Holliday's 'Don't Explain' to her. She sits at the piano and sings one of her favourite songs to cover, Tom Waites' 'Chocolate Jesus', her rich bluesy version makes it seem like a far older song than it is. With a twinkle in her eye, she introduces 'Lay Your Hands On Me' as a song about "when you want someone to touch you in all the right places", as the audiences giggles she announces "I like applause but giggles are even better!" Looking directly at her Mom, she describes her as a "badass" and says, "I don't know if you know this, but I wrote this song about you and for Etta" to which a powerful performance of 'Baddest Blues' follows. At this point we get to know Sebastian, the hardworking guitar tech (there are a lot of guitar changes), as a technical problem brings the show to a halt. 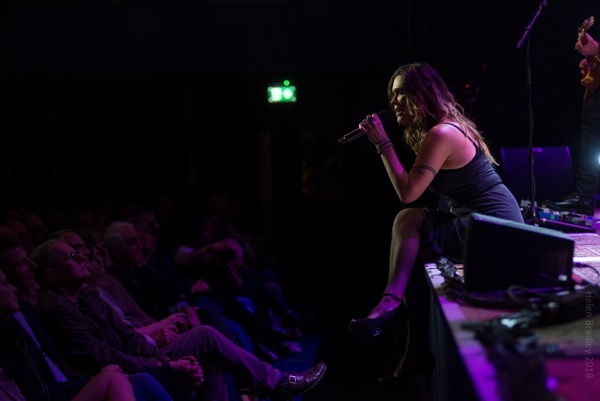 Hart, comfortable with her audience, is unfazed by this, roaming round the stage telling stories and then deciding to sing a song that only needs piano, these are the magic words, order is restored and the entire band play 'Them There Eyes'. Hart reminisces about the time her Mom's boyfriend left her for "Penny up the road", when she hopped in her car to spend a week with her Mom, drinking Tequila and smoking pot to help her get over it. Apparently. This got interesting as bi-polar Hart is not meant to do any of these things, but as always, she got a song out of it and 'Baby Shot Me Down' is a record of the entire incident. Jon Nichols has been with Hart a long time but bass player Bob Marinelli and drummer Bill Ransom have joined her more recently. Marinelli has been teaching Hart the bass guitar and she reveals the band have persuaded her to accompany Nichols on 'G.O.P.'. For me this was the song of the evening, an updated take on an old song, Nichols is strummy and rhythmic and this brings him to centre stage, Hart matches pace on acoustic bass and the song finishes with a lovely little duet between the two of them. It isn't just me who likes it, this song virtually brings the audience to their feet. 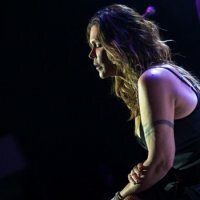 Hart is very open about being bi-polar and I suspect the fact that no two of her set- lists are identical is a product of that; her sets are prepared for each show and I guess are an indication of how she feels that day. Tonight's set has had an air of reflection and reminiscence, maybe it's her Mom's presence, I feel I've been invited in to look at a musical version of the Hart family album with the accompanying laughter, tears, angst and love. This feeling continues as she explains 'My California' is about her love and gratitude for her husband, he slips on to side stage to watch and as she finishes he rushes on to stage, hugs her and sweeps her onto her feet and drags her off stage as she protests, the pair of them giggling like teenagers; it was a sweet, genuine moment and suited the mood perfectly. With that the audience come to their feet calling for her return, and Hart being Hart obliges, and then some, with four more songs. 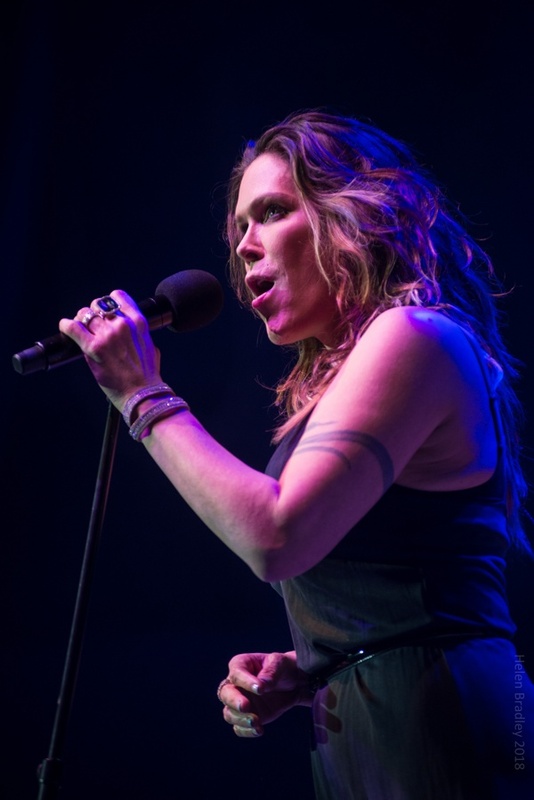 Each time Beth Hart plays she wins over new fans, how can she not, in this age of manufactured celebrity she is the real deal with a genuine personality and a God given talent – she never fails to deliver.